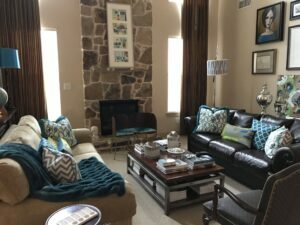 This home has been the perfect place for Wendi and me to start our life together and to launch Lifestyle Frisco. Today, we announce that we’re moving out of the place we’ve called home since getting married in 2012. But don’t worry… We’re not leaving Frisco! We know this house will take care of its next tenants as well as it has us. 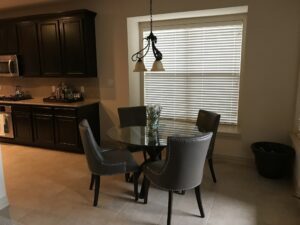 So, if you’re looking for a home to rent, or know someone who is, read on… This home as been amazing! The location of the home in the Cobb Farm neighborhood, at the northeast corner of Eldorado and Legacy Drive, just can’t be beat! We’re in WALKING DISTANCE to Market Street grocery store, an AT&T store, Your Pie, Scotty P’s Hamburgers, Mary’s Mediterranean, and Serenity Nail Spa. Plus, you’ll be on the Tollroad in less than 1 minute. 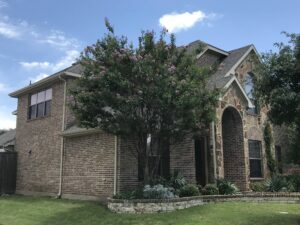 For recreation and a return to nature, in less than 1 mile, you can walk from your home on Sunny Street to the Cottonwood Creek Trail entering in front of Wakeland High School. Want to head to Downtown Frisco? Travel time to Frisco Square is approximately 5 minutes and you’ll be at Randy’s Steakhouse, Eight 11 Place, or Lilian Welch in less than 8. Built in 2009 and just shy of 3,900 square feet, this home has only been lived in by the two of us. It’s never known smoking, pets, or children and is in excellent condition. 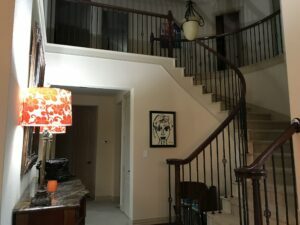 In our case, we’ve used the two “kids bedrooms” upstairs as our offices, plus maintaining a full guest suite upstairs with the master bedroom suite downstairs. We also love intimate gatherings and entertaining. 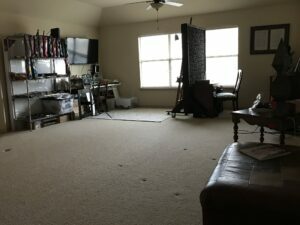 So, that downstairs front-of-the-house room that most people use for a home office? Yeah, we turned that into our personal “wine room.” It’s opened by French doors and this formal room served as our wine-drinking and conversation room. 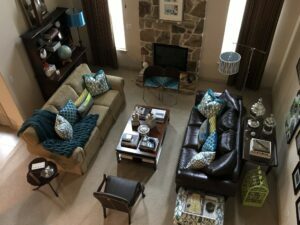 When it comes to entertaining, the media room upstairs in this home has been amazing! We’re not big TV watchers, but when we want to escape, it’s been the perfect room for movie-watching and the occasional (House of Cards) series binge. The media room includes a full wet-bar and place for a small (trash compactor-size) refrigerator. So, it’s easy to lose yourself in there for the better part of a day. 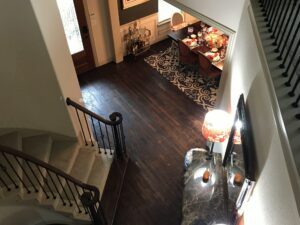 The dark hand-scraped hardwood floors create a beautiful entry, dining, and main hallway. The kitchen and bathrooms are tiled, while the rest of the home has cream colored carpet. 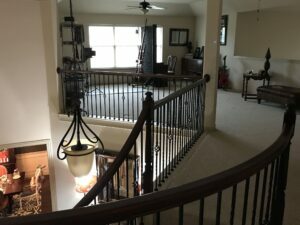 This home has an extremely open and spacious feel due in large part to excellent flow and natural openings between the entry way, formal dining room, kitchen, and great room. 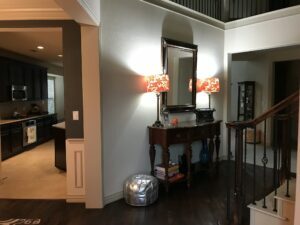 In the main living area, the fireplace is flagstoned all the way up the 20″ ceiling which is open from the second floor, drawing you eye up and making the room look even larger. 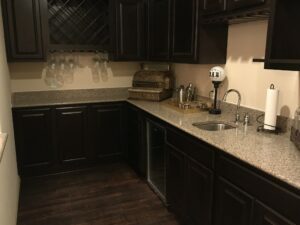 In the kitchen, you’ll find a TON of counter and cabinet space and the dark wood cabinets reflect the dark wood floors while the lighter granite countertops, backsplash and floor tile keep the kitchen feeling open and large. 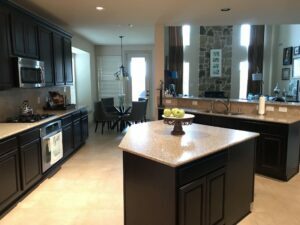 The kitchen also includes an almost 5′ x 5′ huge center island which is perfect for prep and presentation. The GE Profile stainless steel appliances accent the kitchen nicely. Cobb Farm is a 5-star neighborhood and the last lots were built in 2013 – 2014. The residents take great care of the common areas and communicate well when there are things you need to know. The Cobb Farm Facebook page (residents only) is particularly active. Cobb Farm has a community pool which is open for approximately 6 months out of the year, occasionally hosting community activities, and a small kids jungle gym area on mulch for safety. One aspect of the home we’ve been impressed with is how well insulated and efficient it is. Our energy bills have, even in the heat of summer, been less than our previous apartments which were less than 1/3 the square footage. We’ve maintained pest control with Safe Pro since we moved in and never had an issue with bugs, rodents, or anything of the sort. 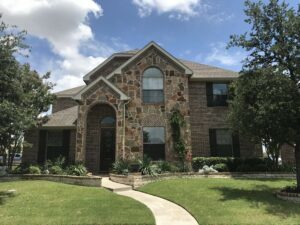 If you rent this home, we’ll leave you a list of recommended service providers (for lawn care, pest control, etc.) as well as the documentation to things like the measurements of the various air filters, light bulbs, etc. to make your transition into the home as easy as possible. but we’re glad someone else is going to have the opportunity to enjoy it! Please click on each image below for a larger version.